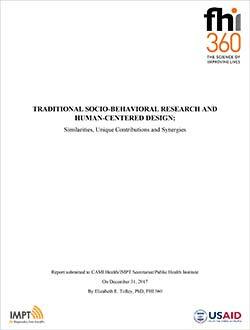 This report by Dr. Betsy Tolley (FHI 360) presents learnings and reflections on traditional socio-behavioral research (SBR) and human-centered design (HCD) as applied to the global health context – specifically in biomedical prevention for sexual and reproductive health. In comparing these methodologies and examining their strengths and shortcomings, we can identify potential synergies to further inform the development and eventual introduction of MPTs in targeted end-user populations. Also, check out Elizabeth Russell’s companion piece on the USAID Office of HIV/AIDS Research Blog.